Meticulous and obsessional, DI Chandler and his unit are based in Whitechapel - an area drenched in dark history and sinister goings-on. It is where Jack the Ripper carried out his horrific crimes. It is where The Krays constructed their Empire of Crime based on violent punishments. This series unearths a Whitechapel full of Gothic shadows, cobblestones and ancient hostelries. There's fear in the Huguenot weaving houses of Wilkes Street.. The streets of London's East End are awash with blood. A murderer stalks the night, picking off vulnerable women and leaving them brutally butchered. But this is not the 19th Century; this is not Jack the Ripper - this is a copycatkiller and once again the police remain clueless... For fast-tracked, media savvy DI Chandler it's his first big murder case; for front-line, hard-bitten DS Miles, he's now saddled with a boss who would rather.. 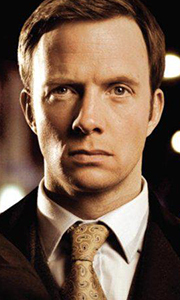 The unlikely team of fast-track cop-on-the-rise DI Chandler (Rupert Penry-Jones) and DS Miles (Phil Davis) are back on the case, along with their uninvited amateur expert on local murder Edward Buchan (Steve Pemberton) in Whitechapel. Hot on the heels of the Jack the Ripper murders, something dark and dangerous is happening on the back streets of Whitechapel. After a spate of gruesome killings and maimings, Buchan suggests that the crim..